TICKETS $65 before Nov 27, $80 after Nov 27. $60 for The Workaround Members. Click here to purchase your ticket for this exclusive event: The MoMentum Talks. 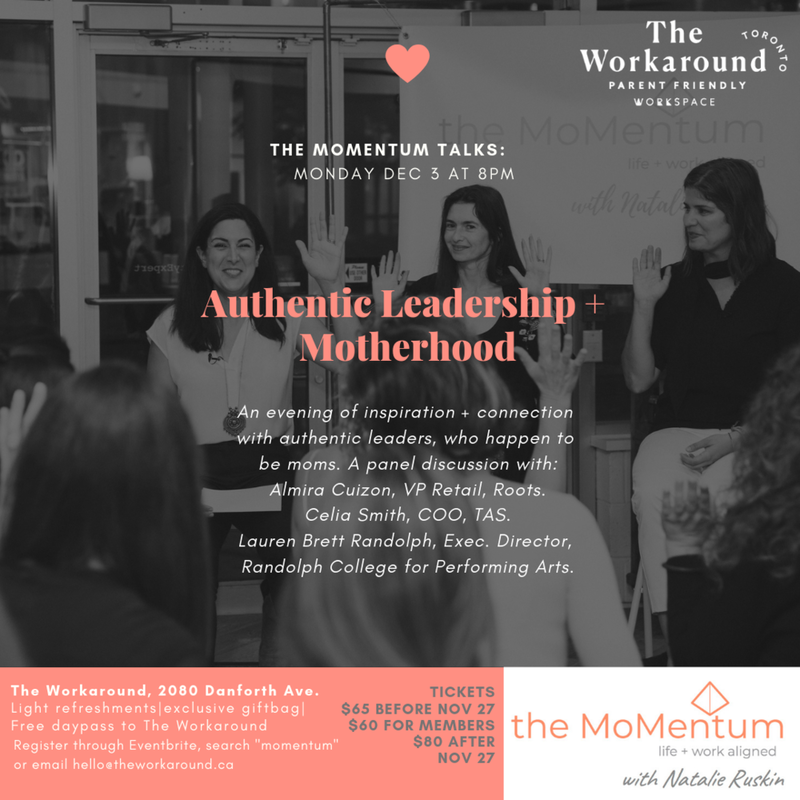 Don't miss your chance to hear the wisdom from these inspiring women and mothers - get your tickets today! PLACE The Detox Market, 420 King St. West Toronto. TICKETS $10, or $20 on event day. THERE ARE ONLY 30 SPOTS FOR THIS INTIMATE & EXCLUSIVE EVENT. Get your ticket for this exclusive and inaugural event: The MoMentum Talks. Meet Natalie and a panel of inspirational and successful moms, listen to their stories and learn how you can achieve the results and success you desire without losing sight of life's other priorities, like family and wellness. Make time for YOU amidst a hectic time of year to catch your breath. Get new ideas and tools from this panel of experts, and hear from attendees how they are elevating their life in a mindful and effective way. Join Bita Doagoo of The Detox Market, Ariel Garten of Muse, and Nikki Leigh McKean of the Let's Radiate Project, for what is sure to be a motivating evening that will ignite your confidence, creativity and conviction. Have a glass of wine and savour the delectable and wholesome goodies from Impact Kitchens, connect with other moms in attendance who are making cool s*#t happen, and take advantage of our special event discount to purchase your favourite skin products, teas and other gorgeous goods at The Detox Market. Bita is not only a naturopathic doctor who effectively empowers patients with a holistic picture of their health; she's also a mom of three young ones and co-owner of The Detox Market, a natural beauty mecca with stores across North America. Ariel is an artist, scientist and entrepreneur who has bridged the gap between all three disciplines. She is the CEO of InteraXon, a company specialized in thought-controlled computing which created Muse: the brain-sensing headband that makes meditation easy. Nikki is an incredible Toronto-based photographer, who has a passion for creative imagery inspired by life's romance and serendipitous moments. She's also the creator of the Let's Radiate Project, a creative mindfulness project that turns your worst enemy into one of the most magical experiences of your life. Don't miss your chance to hear the wisdom of these incredible women and mothers for just $10 - get your tickets today!